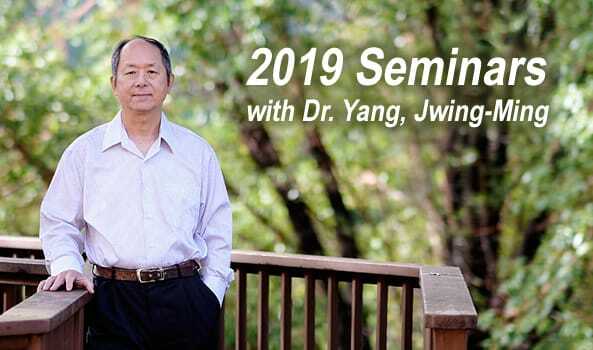 2019 seminars will run from July 12th - August 16th. This seminar will cover The Eight Pieces of Brocade, Five Animal Sports, Four Season Qigong, and Meridian Qigong. It will be 40% lecture and 60% practice. This seminar will cover both theory and practice of Budi Damo's (Bodhidharma) Muscle/Tendon Changing and Marrow/Brain Washing Qigong. In addition, some Grand Circulation Qigong will also be introduced. It will be 50% lecture and 50% practice. Taiji Ball Qigong is one of the most beneficial Qigong practices for health and martial purposes. It emphasizes both internal and external elixir Qigong. In this seminar, Martial Grand Circulation will be taught and will be applied into various patterns of practice. The course will be 30% theory and 70% practice. In this seminar, participants will be divided into two groups, one for Traditional Yang Style Taijiquan and the other for Taiji Sword. Students may choose only one topic since it will be difficult to pick up both in such a short period. The format will be 20% theory and 80% practice. All participants will learn and practice both Pushing Hands and Yin Yang Symbol Sticking Hands. Different groups, from beginner to advanced, will be divided accordingly to the levels. The format will be 20% lectures on theory and 80% of learning and practice.